This year's theme focuses on residents' right to vote and be engaged in the political process. Consumer engagement, including the right to vote, is a cornerstone in our society. Consumers receiving long-term services and supports retain their voting rights no matter where they live or what type of care they receive. 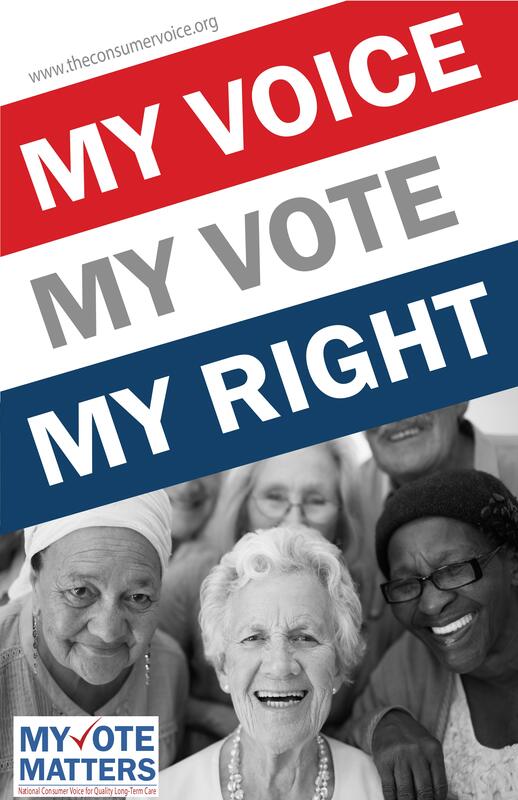 This year's Residents' Rights Month seeks to support a consumer's right to vote and participate in the political process. View Resident's Voice entries here. Consumer Voice is pleased to announce the 2016 Resident’s Voice Challenge! Creative writing and artistic expression are meaningful and compelling ways to communicate the importance of residents’ rights and how these rights can be carried out in all long-term care settings. 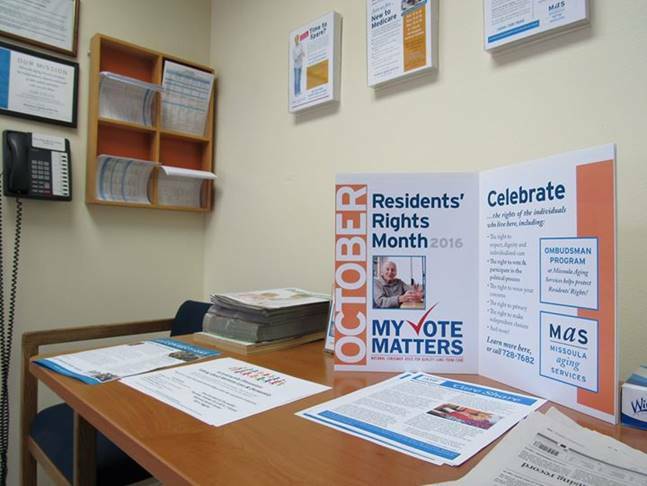 For this year’s Resident’s Voice Challenge, residents are encouraged to pick up their pens, dust off their type writers or use a computer to display their writing or artistic skills by submitting essays, poems, artwork, drawings, or videos related to the theme for Residents' Rights Month 2016 "My Vote Matters". Entries submitted for the Resident’s Voice Challenge will be compiled and shared in a variety of formats. Submissions may appear on the Consumer Voice website, be featured at the 2016 Annual Conference, be highlighted in our weekly e-newsletter - The Voice, or be used in additional forums. 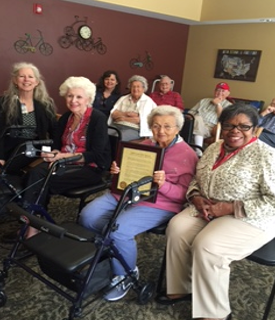 Every resident who submits an entry will receive a certificate for participating in the 2016 Resident’s Voice. 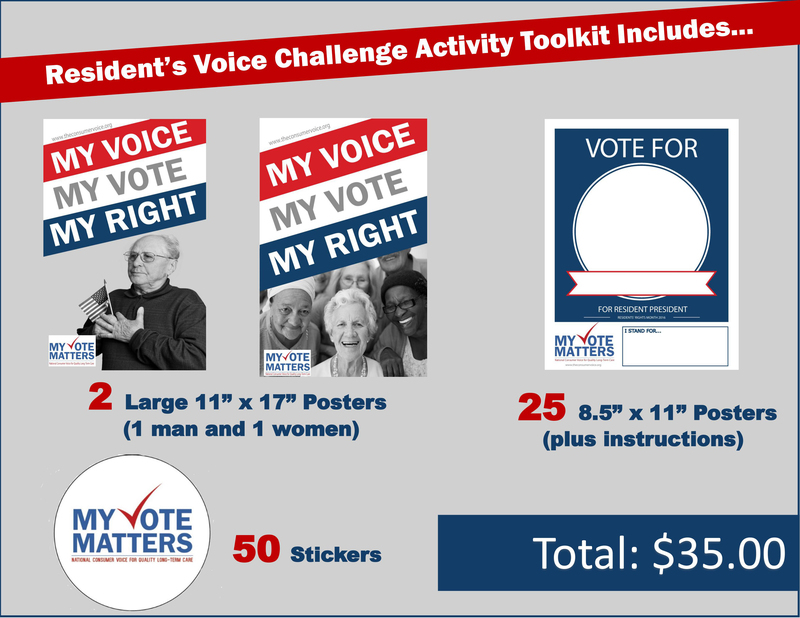 Purchase a Resident's Voice Activity Toolkit! We are asking residents and consumers to participate in one of the following activities and submit entries using the guidelines below. For residents and consumers: Pretend you are running for President and your platform is long-term care consumers’ rights. Create a campaign poster or write a stump speech (or record a video of you giving your stump speech). Campaign posters are available for purchase in the Resident’s Voice Activity Toolkit or can be downloaded here. Find specific instructions for this activity here. 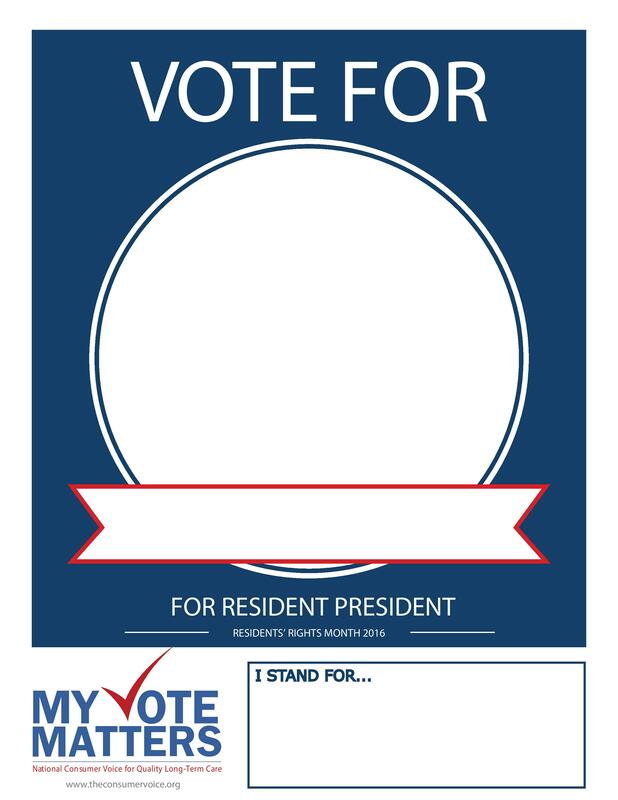 For examples of completed Resident President posters, click here and here. Write an essay, create a poem, or express yourself artistically sharing the most memorable election in which you voted. What Would You Tell the Current Presidential Candidates? Imagine you got a meeting with one of the current presidential candidates. Which candidate would you speak to and why? What types of questions would you ask them? For more information and for submission guidelines, click here. Submissions are due by September 23, 2016. Photo and Video Release Form - All residents and consumers who share photo or video with Consumer Voice as a part of the Resident's Voice Challenge must complete and photo/video release. Participate in Residents' Rights Month activities and show your support of long-term care consumers' voting rights with this year's Residents' Rights Month products! *Already have your materials? Send us photos wearing your My Vote Matters stickers and of your completed Resident President posters! Some states have recently instituted new laws which require voters to show valid photo identification in order to vote. These voting restrictions can make registering to vote or casting a ballot difficult for some elderly and disabled people. Though residents and consumers receive health services, this by itself does not legally necessitate obtaining or providing photo identification. Often, residents and consumers do not have access to the necessary forms of identification or documents required to vote. (NEW!) Fact Sheets for Long-Term Care Consumers - Print these fact sheets and distribute to nursing home residents, home care consumers, family members, and any other individuals interested in this important information. (NEW!) Promising Practices for Accessible Voting in the 2016 Presidential Election - A review of successful practices during the 2012 election, plus tips for practices to incorporate this year. This fact sheet is geared towards advocates, facilities, volunteers, and ombudsmen. 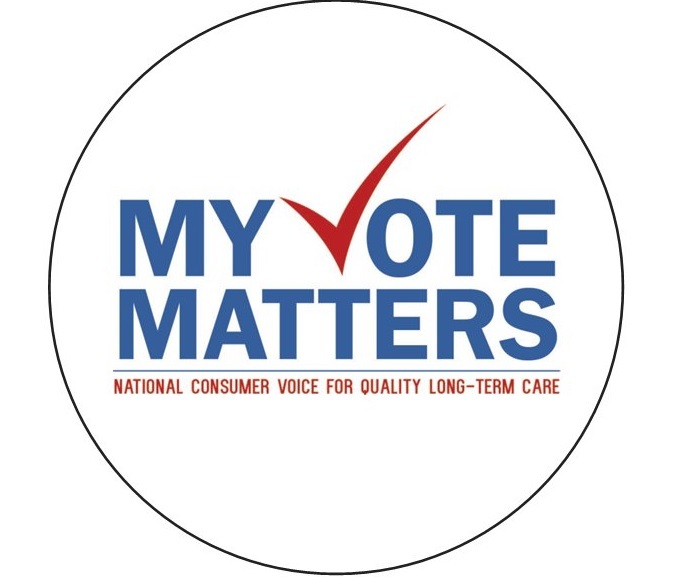 NORC Issue Page on Voting - Resources and information about the involvement of Long-Term Care Ombudsmen Programs in advocating and aiding in the voting process of long-term care residents. 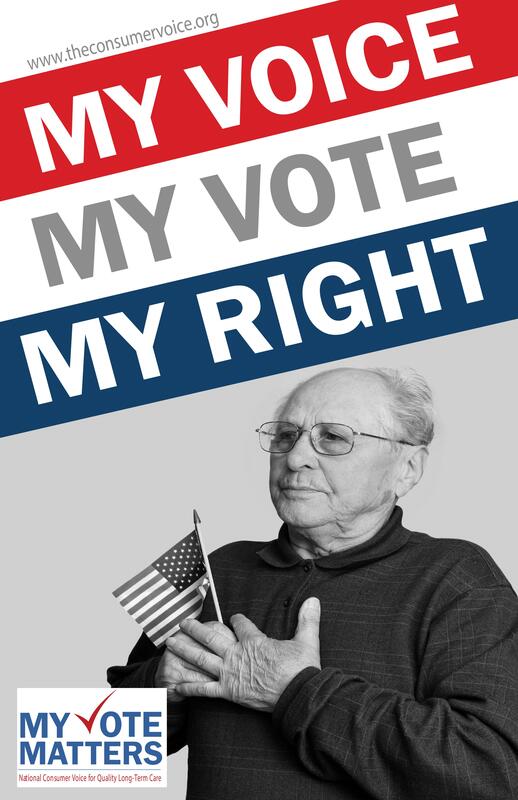 Alliance for Better Long-Term Care in Rhode Island is promoting residents' right to vote and the Residents' Rights Month theme, My Vote Matters. Click here to see their letter and here to see the information distributed to residents. D.C. State Long-Term Care Ombudsman, Mark Miller, goes on the air withThe Senior Zone host, Shawn Perry. In recognition of Residents' Rights Month in October, Mark spoke about the rights elders should expect when receiving long-term care. (Interview begins at 6:50). Click here to listen. The Sentinel and Enterprise in Worcester, Massachusetts wrote a column about Residents' Rights Month and the importance of visiting residents in long-term care facilities. Read the article here. The Missoulian in Missoula, Montana wrote an article highliting the theme of Residents' Rights Month "My Vote Matters." The article says, "During Residents’ Rights Month, Missoula Aging Services will be helping to get the word out about residents’ rights and Missoula Aging Services’ long-term care ombudsman, available in all Missoula County nursing homes and assisted living facilities for residents, their families and caregivers. During Residents’ Rights Month, we recognize our local long-term care ombudsman program staff and volunteers. The Missoula Aging Services’ Long-term Care Ombudsman Program protects residents’ rights, prevents elder abuse and resolves complaints." Read the full article here. Missoula Aging Service's Residents' Rights Month display. In Phoenix, Arizona the Sonoran News wrote an article about educating the community about a resident's right to vote. Read the article here. The Surfky News in Owensboro, Kentucky wrote an article about Residents' Rights Month. The article says, "These rights are part of the Nursing Home Reform Law that was passed by the U.S. Congress in 1987. The two key provisions of this law focus on 'quality of life' and 'quality of care.'" Read the full article here. 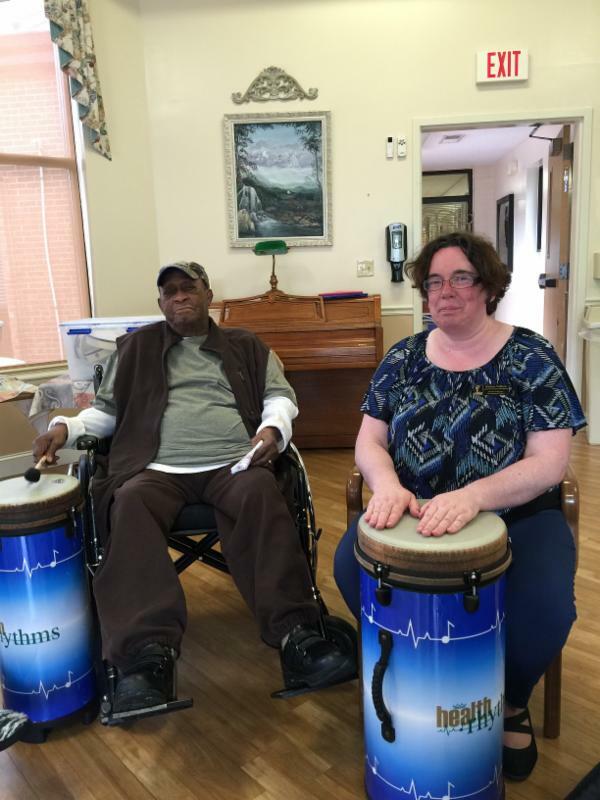 Katrina Valliant, District Long-Term Care Ombudsman (DLTCO) in Lincoln Trail used drumming as a fun way to chant about resident rights. Sheila Howard, DLTCO in Green River participated in a panel discussion for a college gerontology class where she explained and explored with students how ombudsmen advocate for resident rights. Beth Love, DLTCO in Buffalo Trace helped residents host and coordinate a local candidate forum. Arlene Gibson of Cumberland Valley and Denise Kennedy of the Bluegrass coordinated with the National Consumer Voice and helped residents participate in national activities with residents from across the country. Vanda Chambers, Fayette County facility LTC Ombudsman individually consulted with a resident about her rights. Other DLTCO have also been busy providing Residents' Rights education sessions for residents, families, and facility staff including Tara Little of Big Sandy, Waynanne Caudill of FIVCO, Mandy Weston of Lake Cumberland, Bethany Breckel of NKY and Ceila Gutfreund of Purchase. 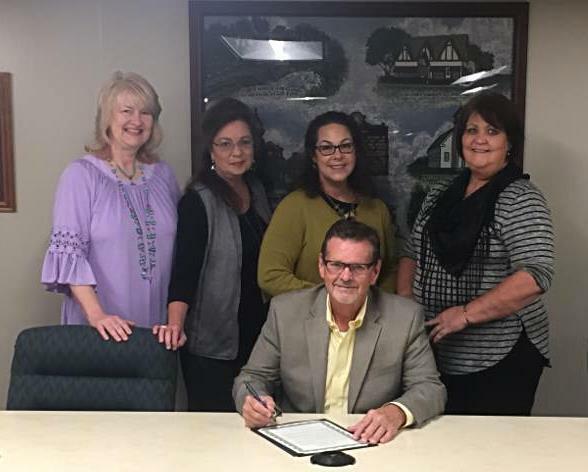 Mayor Troy Rudder of London (pictured above) signed a proclamation designating October 2016 as Residents' Rights Month. 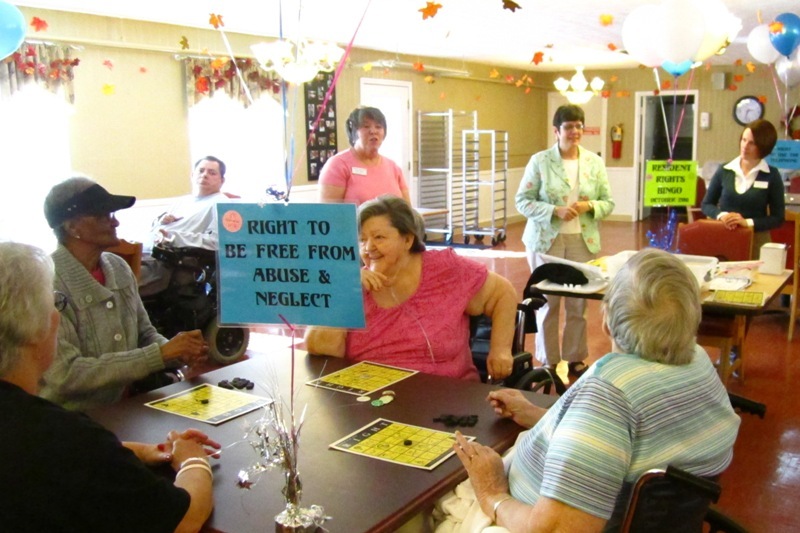 Residents' Rights Bingo is a fun activity enjoyed by many. Susan and Gene of NHOA are pictured above leading Rights Bingo. WISN in Milwaukee, Wisconsin wrote an article about the importance of residents voting. The article highlights common problems for residents when they try to vote as well as their rights that are included in the law. Read the full article here. A recent Iowa State Ombudsman e-newsletter includes an article explaining how facilities can assist residents when registering to vote and how they can encourage them to provide residents with information about upcoming elections. To read this article, click here. The Pennsylvania State Long-Term Care Ombudsman Program will host a Resident Council Skill-Building webinar, which is intended to inform and guide long-term care residents and ombudsmen on how to either start a resident council or enhance an existing council to be more resident directed. The webinar will also serve as a vehicle for participants to share ideas, express concerns and ask questions. The webinar release is timely as the department observes October 2016 as National Residents' Rights Month, an annual event that focuses on and celebrates awareness of the dignity, respect and value of each individual long-term care resident. Also in Pennsylvania, an article was published in The Sentinel about residents writing letters to presidential candidates. The Messenger-Inquirer in Ohio wrote an article about the importance of Residents' Rights Month. Read the article here. In Oregon, Governor Kate Brown proclaimed October Residents' Rights Month. The Georgia State Ombudsman Program was invited by Aspen Village to celebrate and acknowledge resident rights by participating in a Residents’ Rights Month “Ask and Answer” event. The Eastern Regional Ombudsman for the Kentucky Long-Term Care Ombudsman Program celebrated Residents' Rights month by writing a blog called, "Your Right, Your Records!" Read the blog here. Also in Kentucky, Regional Long-Term Care Ombudsman Jodi Holsclaw wrote about residents' right to access their medical records. Residents in Grand Junction, Colorado celebrate Residents' Rights Month.